At some time in your life, if you are fortunate enough, you will be purchasing or selling a home. Do you ever wonder how to choose an agent and or a real estate office to represent you? Many people “know” a realtor and are comfortable enough with that person to represent them during this large undertaking. However, often times when the decision to buy or sell comes up in one’s life, they are not sure where to turn. A safe bet is to ask around and get referrals from friends and family. Chances are, if you do not know a realtor personally, you know someone who does. There are several things to consider when choosing a realtor. First and foremost, you want someone you trust. Although all realtors must abide by a strict code of ethics, people and personalities are different. Nothing can be more frustrating than working with someone who has a different set of ideals and priorities than you. Also and often just as important, you want to engage in someone who knows and lives in the same market as you are considering buying or selling. This agent will be more aware of each and every sale within that market area and will be better prepared to assist you in preparing a list price or an offer. Another item to consider is using a realtor whom works in the real estate business full time. Like anything, the more you do it, the better you will be. So often real estate agents are “part-timers” and thus may not be as prepared or as knowledgeable as one who works in real estate “for a living”. Experienced agents can not only help you buy and or sell your home, but they will be better prepared to educate you on how to “stage” your home, how to price your home, market the home and ultimately see it through to closing. Experienced agents will also be more familiar with the current financing industry which can go along way when applying for a mortgage. This also holds true in preparing your home so the bank will not find problems with your home which might be a red flag. An experienced agent will be more familiar with the entire process to include meeting deadlines within the contract, dealing with the appraiser, the loan officer, the attorneys and the home inspector. Another factor one should consider when choosing a realtor is service. Remember, realtors are getting paid a commission and thus, you want this person to provide you with the best service possible and treat you like you are their only client. There are many agents out there whom have their face painted on all the billboards in town and you see their name everywhere. This is not a bad thing as they are trying to make a name for themselves, however be careful because so often, they are so busy and representing so many clients that they will not be there for you when you need them. If you are considering buying a house, you want your agent to be able to show you properties based on your schedule, not theirs. This is the same idea when choosing a real estate office. Large real estate offices often times have more resources available for you, however the same principle applies. You want to make sure you are not treated like a number. A smaller real estate office will often not have as many clients and thus will often be able to provide you with a more personal and one on one service. This is not to say larger firms do not treat you well, it just means when there are more clients to serve, there may be less service to go around. When it comes to listing a property, people so often want to have a sign in front of their house that is recognizable. This is very understandable, however, if a house is properly priced and shows well, it does not matter what sign is in front of the house. A potential purchaser will be willing to look at a house that shows well and is properly priced no matter what sign is in the front yard. If the office you choose is a member of the local Multiple Listing Service, your house will be marketed throughout the internet the same as any other office. Again, potential purchasers do not care who is selling the house, they are interested in the house itself. In conclusion, as you can see, there are numerous factors to consider when choosing a realtor and a real estate office. The above are some items to consider while making your decision. Take your time, do your research, and hopefully your decision will make the entire transaction a satisfying and successful one. Beautiful Custom home in desirable Sydney Hill, just 7 minutes to downtown. Open floor plan with 1st floor master suite featuring a large bathroom and fireplace. Large great room with cathedral ceilings and windows galore facing the heated salt water IG pool. Cozy insulated Adirondack 3 season room. Upgrades include 9' ceilings, crown molding, wainscoting, granite counters, French doors, built in speakers, security system, and more. Finished basement. Great track rental history! When I moved to the town of Wilton in 2000, little did I know what a great plus it was moving just minutes from Gavin Park. I had two children at the time and now have four. I thought it was great to have a town park nearby. What I did not realize was that Gavin Park is not just a town park, it is the crème de la crème of town parks! The below clip is taken directly from the town of Wilton website regarding Gavin Park. Gavin Park is a central recreation complex for residents of the Town of Wilton and surrounding communities. Not only does Gavin Park offer a myriad of youth activities such as an After School Program and Summer Day Camp, sports programs for baseball, soccer, basketball, pickle ball and coaches’ clinics, and family celebrations like the Holiday Tree lighting and Community Day, and also hosts several regional athletic tournaments and events that bring thousands of people to the area who frequent local shops, restaurants and hotels. Additionally, Gavin Park provides employment opportunities for many area youth. Although this description makes the park sound inviting, it does not do it justice. The entire park is irrigated ensuring plush grounds and features several soccer and baseball fields, tennis and basketball courts, playground, waterpark, ice skating park, and a 1.17 mile running/walking trail around the entire perimeter. There are two gymnasiums for basketball, volleyball and pickle ball. Along with all the recreation facilities, there is a large pavilion for parties and events. The park host numerous events throughout the year to include several soccer and baseball tournaments which attract teams from throughout the northeast. ParkFest is another great annual event which brings 10,000 visitors. It is the town of Wilton’s fun filled community day and features all kinds of free activities such as face painting, a petting zoo, kids fun run, 5k race, numerous vendors, live music, amusement park rides and a fireworks show at the end of the day. There are also several kid and adult programs which take place throughout the year. There is always something to do at Gavin Park! One of the two gymnasiums was built in 2006 by the “Christopher Dailey Foundation”. The below clip is from the Gavin Park website regarding Christopher and the Christopher Dailey Foundation. Christopher Dailey was an active and spirited 8 year old “boy next door,” a third grade student at Dorothy Nolan Elementary School, and the beloved son of Mark and Maria Dailey of Wilton, NY. On November 23, 2001, the day after Thanksgiving, Christopher died suddenly in the hospital. His sudden and tragic departure left a devastating void not only in his family, but also with his playmates, friends, neighbors and fellow students. This foundation was established with a goal to build a lasting and living memory of Christopher through the construction of a youth recreational facility somewhere in the Greater Saratoga Area. The stipulations were simple: To enrich the children of our community with a place to play, learn and enhance their lives through team and individual sports activities in a facility that bears his name. The Christopher Dailey Memorial Youth Gymnasium was completed on March 2nd, 2006 and is currently getting extensive use by our community youth. Aside from building the gymnasium, it has also supported numerous organizations such as the Double HH Ranch, Special Olympics of NY, Project Lift, along with financial support for just about every sports activity and organization in the Wilton and Saratoga Springs area. As you can see, Gavin Park and the Christopher Dailey Foundation combine to enhance this already beautiful area to raise a family. If you have any questions or would like more information regarding Gavin Park or the Christopher Dailey Foundation, please visit www.christopherdaileyfoudation.org or feel free to contact me at (518) 281-4113 or DMunn@HighRockSells.com. This week, I decided to change directions and post an article recently published in the Norwich Record about my brother, Chris Munn, who is battling ALS. Please take a moment to read and share to help raise awareness! On 23 December, 1776, in an essay titled “The Crisis,” Thomas Paine described how, in response to life-threatening situations, “summer soldiers and sunshine patriots” will inevitably shrink from their obligations in the hope that others will step forward. This is the story of a man who did just that. In a time of seemingly insurmountable personal circumstances, retired Army Colonel Chris Munn has stepped forward to make a difference in the lives of others and, in the process, has inspired many to do the same. When he was diagnosed with ALS in 2013, Chris admitted that “…he knew the linkage to Yankees great Lou Gehrig, but little else.” ALS, a neuro-degenerative disease with no cure, works mysteriously to rob victims of control of portions of their own bodies and in the process robs them of their dignity. His own diagnosis influenced him to learn as much as he could about the disease, to review treatment options, and to face some very difficult news about an insidious opponent. The initial research Chris performed was discouraging. The statistics speak for themselves: ALS often results in death within two to three years following diagnosis. What Chris did next speaks volumes about the man that he is: He elected to step forward, rather than shrinking back. He told people, family first, then close friends, college teammates and he eventually allowed his story to be shared during a TV report covering a rugby tournament bearing his name. Drawing on his life’s experiences, passions, and training, he made up his mind that he would raise awareness by fighting—and beating this disease. Growing up the sixth child of eleven, Chris learned important lessons about life early and often. His father served in the U.S. military (Army Air Corps and Air Force) for 24 years, eventually retiring as a colonel. The opposite of a “sunshine patriot,” he was a highly-decorated officer who fought in WWII in the air campaign over Germany. During his dad’s fourth mission, his plane was shot down and he parachuted from his B-17 bomber before it exploded north of Berlin, Germany, in 1944. He was captured and imprisoned in a German POW camp until the camp was liberated by the Soviets in 1945. Chris’ mother was a homemaker, who devoted her life to raising 11 kids while moving around the country as a military spouse. Chris attended Norwich University where he played ice hockey and lacrosse, and captained the rugby team his senior year, further strengthened his character. It reinforced his belief that there truly are no mountains too tall, no opponents too tough, and no challenges that cannot be overcome, whether on playing fields or in life. Chris also served in the Army for 26 years, attaining the rank of colonel and deploying to hot spots all over the world, following in his father’s footsteps. Upon retirement from the Army, he could have chosen a more leisurely lifestyle. Instead, he went to work for the federal government at Fort Drum, N.Y., where he was heavily involved with preparing units to deploy overseas to combat zones in Iraq and Afghanistan. Thus, the brotherhood which had begun on icy skating rinks, worn lacrosse fields and uneven rugby pitches at Norwich and elsewhere, and continued during his Army career, soon expanded in the service of others. Word quickly spread of Chris’ diagnosis among his former teammates and colleagues. When asked they could do to help, he would answer, “Please help me increase awareness of this dreaded disease.” Inspired by his courage and determination, one classmate believed that a former Norwich rugby tournament—which after being held for many years but had been discontinued—could be re-started and named in his honor. Bob Weggler, the Norwich rugby head men’s coach, heartily agreed and quickly coordinated with other coaches to build a tournament in record time. Another teammate was inspired to establish a scholarship in Chris’ name at Norwich, to be awarded to a player who demonstrated courage and leadership on the field and at the university. In this fashion, the brotherhood expanded. With little fanfare, but after weeks of teleconferencing and countless emails, the inaugural Chris Munn Rugby 7s Tournament was held at Norwich University in April 2014. Legions of Norwich teammates and classmates heeded the call and returned to Northfield, Vt., to reminisce and to show support for Chris. Members of the rugby, lacrosse, and hockey teams showed up in force, joining friends from Chris’ hometown, siblings, college classmates, in an outpouring of love and support. While Dartmouth College, Chris’ father’s alma mater, prevailed in the men’s bracket, Norwich took home top prize in the women’s bracket. The type of rugby played that day was fast-paced, competitive, and highly skilled. During the tournament, coaches and players would share personal stories of knowing someone lost to ALS and offering words of encouragement to Chris (and his family, siblings, and loved ones). Norwich Alums gathered around Chris Munn (circled) at Sabine Field on the campus of Norwich University on 27 April 2014. In addition, representatives from the ALS Association of Northern New England provided informational materials and answered questions about the perplexing disease. The rugby tournament, along with Chris’ desire to raise ALS awareness in the region, was well reported by television station WCAX in Burlington, Vermont. During the interview segment of the coverage, Chris described the symptoms he was feeling, and his overwhelming desire to raise ALS awareness, a disease which had claimed four Norwich alums in the previous 24 months. Inspired by Chris and challenged by their players in September 2014, coaches Bob Weggler and Austin Hall took the ice bucket challenge during the annual Northfield Labor Day parade while members of their teams handed out ALS literature to the crowd watching the festivities. Norwich ruggers used enhancing ALS awareness as one of their public service projects during the 2014–15 school year. Meanwhile, Chris began to research experimental drugs being tested to combat the effects of ALS and began to advocate for the United States Food and Drug Administration (FDA) to alter its rules under which ALS patients could gain access to drugs being tested prior to FDA approval. The lengthy FDA multi-year cycle of testing and approval process for new drugs meant that many ALS sufferers would potentially suffer without access to drugs showing promise. Chris’ advocacy led to many friends, classmates, and teammates signing petitions to the FDA asking that it rewrite its regulations. In addition, they sent many letters to members of Congress seeking support for such a revision. While no decisions have been made, reportedly the current FDA rules are still being reviewed. During the course of the Second Annual Chris Munn Sevens Rugby Tournament, Chris met personally with each of the rugby squads and shared stories with the young ruggers. Prior to the championship matches, which would crown the three division champions, he addressed the teams that would compete in the finals. A hush of unusual silence came over the group, as all eyes were affixed on the former Norwich rugger who spoke about his personal battle and commitments to overcome this life-threatening hurdle. He spoke about how his rugby teammates were like brothers to him, and that in his time of need, they were there fighting alongside him. Chris Munn reminds all of us about the importance of fighting hard and never giving up in times of turmoil. The recent tournament was like a medicine for him—a source of healing. The look amongst the members of the senior class was telling, as only a few short weeks from graduation, many were preparing to play their final match on the pitch at Norwich. Just as quickly as the grouping formed, away they went to prepare for the championship matches. Chris Munn addressing assembled rugby teams just prior to the championship matches on 26 April 2015. The schedule for the spring tournament (Chris Munn 7s) is scheduled for 1 May 2016. Planning for the Third Annual Chris Munn Sevens Rugby Tournament is underway as fundraising to build an endowed scholarship at Norwich University in Chris’ name continues. For Chris, his battle continues. Anyone fighting ALS will tell you that he or she is enjoying as many todays as possible. For Chris, his journey continues by sharing time with his wonderful wife Tammy and two sons, Chris and Ryan. Whether it be on a mountain bike, ice skates, snow skis, or a midnight canoe ride on the lake with one of his sons on a whim, Chris is truly living every day to its fullest—inspiring classmates, teammates, brothers and sisters with his words and more importantly with his actions. For us, the message and the inspiration are clear for others to emulate: Chris Munn, ALS advocate, courageous fighter, and a member of the band of brothers, continues to spread the word about ALS, to help build awareness, to gain FDA approval for possible life-saving drugs, to counsel the young, and as always to be the very best friend, classmate, father, husband, son, sibling, and rugby teammate possible. How can you help? Awareness: Visit the ALS Association website (http://www.alsa.org/), learn more about this illness, and see how you can easily become an advocate in your local community. Insight: Speak to family members, friends, co-workers and others about ALS, about Chris Munn, and about others who refuse to have ALS define their lives. Help spread the word about the courage, commitment, and resilience that members of this community demonstrate daily. As a NYS certified appraiser and a RE Broker, I am often asked what is the best way to prepare ones house for sale. This is a wide open question and the answers are not always black and white. They are based not so much on a blanket response, as much as one that is catered to the specific property. One quick answer is to ask the homeowner “what would you like to see if you were looking at your home to purchase it?”. So often the results depend on location, as well as what market segment the house would draw. Is it located in downtown Saratoga Springs or a suburban setting in the town of Wilton? Would the potential purchasers be empty nesters, young families, urban professionals, etc? Knowing who would be interested in the property can have an influence on how to prepare it for sale. The goal is simple: what can you do to maximize the value of your house without spending more money than you will see in return? By determining who the potential purchasers might be, you can refine what should be done to gear the house towards that market segment. If the house is ideal for a first time home buyer, you would not necessarily finish the home with “top of the line” finishing materials. You may want to prepare the home so it is in “move in condition” and not necessarily break the budget. Some not so expensive and simple steps such as paint, new flooring, lighting fixtures, outlet covers go a long ways to improving the appeal of a property at minimal cost. Remember, you are trying to appeal to first time home buyers, so the quality is not as important as utility and overall condition. In contrast, if your property is two blocks from Broadway in Saratoga Springs, where the location appeals to a wide spectrum of buyers, you may want to prepare the home with upgrades and features which appeal to a more affluent buyer. Of course, this may cost more, however, when you are in an ideal location, you will often see the return on your investment. If you are not sure what steps you should take in getting your home ready for sale, I strongly advise you consult a realtor or an appraiser. If you have any questions, please feel free to contact me at DMunn@HighRockSells.com . As you may know, Saratoga has bragging rights to quite a few accolades, from the happiest city in New York to one of the best college towns for food. We were excited to see that both the Spa City and the nearby village of Ballston Spa have just been named the best in another category! Both of these historic places in Saratoga County have been crowned as one of thebest places to retire in New York by SmartAsset. The methodology? The company looked at state and local tax rates, the number of doctors' offices, recreation center and retirement centers per thousand residents and the number of seniors in each area as a percentage of the total population. In the final analysis, SmartAsset ranked each community on these three factors to determine where would be the best place for a happy and healthy retirement.Saratoga Springs scored a number six spot and Ballston Spa beat out the Spa City, with a number two ranking! With beautiful historic architecture, a thriving restaurant scene, friendly people and a wide array of things to do year-round, it's hard to beat as a place to spend the relaxed years of retirement. As you may know, Saratoga has bragging rights to quite a few accolades, from thehappiest city in New York to one of the best college towns for food. We were excited to see that both the Spa City and the nearby village of Ballston Spa have just been named the best in another category! If you are interested in buying an investment property, here are a few things to consider. Most importantly, you should determine what your goal is. Are you purchasing property to create monthly income, is it an investment for the future, or possibly both? The reason for your purchase can often times dictate the path you take. If you are looking for a long term investment by creating equity down the road, I would suggest putting as little money down as possible and using as much of the monthly rental income as you can to pay down the mortgage. For example, if you borrow $200,000 at 4.5% for 15 years, your monthly payment would be $1,530. This would leave very little, if any, money left over after your other monthly expenses were paid. However, you would be paying $780/month down on your principle. When you add in the benefits of the tax deductions from your mortgage interest, taxes, as well as other qualified expenses, you have created an investment vehicle which can be paying strong dividends a few short years down the road. If you are looking to create monthly income, as opposed to building long term equity, you might consider putting more money down. This would create a lower monthly payment and potentially a positive cash flow on a monthly basis. Instead of borrowing $200,000 at a 15 year amortization, you are able to put $25,000 down and borrow $175,000 at 30 years. Now your monthly payment at 4.5% is only $887. You have created room for a monthly positive cash flow, which was your intent in this scenario. However, keep in mind your principle will only be paid down approximately $230/month, so it will take longer to pay down the balance. The last thing I would like to cover is the expenses that are involved with owning an investment property. So often, I run into purchasers who do not consider ALL the expenses associated with managing a property. Let’s examine a 2 family home I currently have listed at 57 Church Street in Schuylerville, NY. Let’s say the purchase price is $142,000 and the current rental income $1,800. The purchaser’s intention is to create a positive cash flow so he/she has some monthly income. The buyer has decided to put 20% down which would create a mortgage amount of $113,600. Based on a 30 year note at 4.5%, the monthly payment would be $575.59. Wow, this sounds great! We have rental income of $1800 and a mortgage payment of under $600. Now let’s add all the expenses to see how this plays out. The owner pays for gas, water, and sewer. The current tenants are in charge of their own garbage removal, electricity, and snow removal in the winter months. As we see in the example above, based on a monthly rent of $1,800, there is a positive cash flow of $411.43/month. Although this does not appear to be too much, it is $4,937 annual income which is just over a 17% return on your initial investment of $28,400. When we add in the tax benefits and principle reduction, it is not a bad ROI (return on investment) considering what the Stock Market is currently doing! Please do not hesitate to contact me with any questions at DMunn@HighRockSells.com. In addition to Saratoga Springs being a physically beautiful city; low crime, great schools and a walkable vibrant downtown, make Saratoga Springs a very attractive place to live. Dan Munn , local real estate broker and appraiser from High Rock Realty understands this first hand. “A variety of places to work, to play, and maintaining a city-in-the-country concept collaborate to make Saratoga Springs a unique place in 21st century America”, says Munn. Munn has been an appraiser in the Capital region for nearly a quarter of a century. He enhanced his resume as a real estate broker and turned High Rock Realty into a full service company, calling on the expertise of 18 to 20 combined staff members, agents and appraisers. 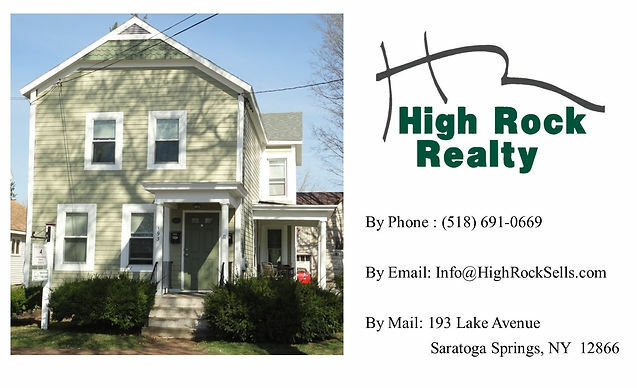 What is the difference between High Rock Realty and other bigger Real Estate Agencies in the area? Striking a healthy balance between suburbia and a downtown district, the Spa City has also helped other communities flourish. “Saratoga is a place where you’re 10 minutes away from countryside, so there’s a lot to offer.” said Munn. As part of your mortgage approval process, your bank will require an appraisal be performed on the house you are buying. The appraiser is a third party hired by the bank to provide them with an opinion of value which will be used for determining how much money the bank will lend you. In most cases, the appraiser is certified by the state he or she works in and is approved to complete appraisals for the bank you are getting the mortgage. You, as the borrower are not allowed to select the appraiser. The appraisal usually takes place after the bank has made a preliminary determination that you qualify for the loan you requested. The appraiser will inspect the property, noting all of the pertinent factors that the typical purchaser would consider when looking at a house. This includes, but is not limited to: location, size, utility, condition, quality of construction, finishing materials, school district, and additional features. To determine the value, the appraiser will examine the market as a whole and identify several “competing” properties which have recently sold and are deemed most similar to the subject. The appraisal is an “opinion of value” and not an equation. Ultimately, the appraiser’s job is to determine the value of the house for the bank. The definition of market value is that price a seller would sell and a buyer would buy, with both parties being typically informed and motivated, allowing for reasonable exposure time on the market, with no outside influences affecting the ultimate meeting of the minds. If all of the above conditions are met, often times the contract price is considered to be the best indicator of value. Upon completion of the appraisal, the entire loan, including all documentation is submitted for review by the bank’s underwriting department. I have been a NYS Certified Appraiser for 24 years. Feel free to contact me with any questions at DMunn@HighRockSells.com.